the plump bird shown standing with wings folded and head held up, well modelled in a realistic attitude, the wings simply moulded, the tail feathers turned up, with an aperture through the chest, the feet moulded together to form the hollow base, the red pottery covered with a green glaze generously applied and now degraded from burial to a silvery iridescence attractively mottled with some blue-green highlights. A very similarly modelled glazed pottery duck in the Shanghai Museum is illustrated in the catalogue of masterpieces from the Shanghai Museum which toured America in 1983–84, entitled Treasures from the Shanghai Museum: 6000 Years of Chinese Art, Shanghai/San Francisco, 1983, no. 54, col.pl. XVIII. 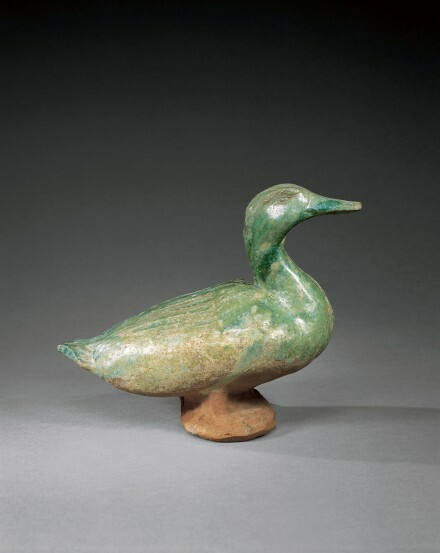 Compare also the similar green-glazed duck in the Boston Museum of Fine Arts illustrated by Tseng and Dart in The Charles B. Hoyt Collection in the Museum of Fine Arts: Boston, Vol. I, Boston, 1964, no. 27.